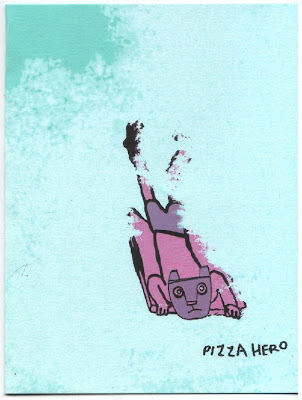 As Wavves, Vivian Girls, No Age and The Pains of Being Pure at Heart seem at the forefront of a noise pop/lo-fi revitalization, Brooklyn's Boogie Boarder seem set to join the movement with their second album, Pizza Hero. Dig that album title? Anyway, I liked their track, "Bio Hassle," enough that I figured I'd post it. Thudding bass amperage and squeaking surf guitar rhythms.